Surya Spa is an authentic, artisan Ayurvedic Clinic offering consultations and traditional treatments, focusing on 3 to 21 day highly-personalized Panchakarma Series. "Ayurveda," meaning the science and wisdom of life, is a comprehensive system of health and well-being, born 10,000 years ago, its ancient roots with the Tamil Siddhas of southern India, who worked developed a system of life-extension, life-enhancement, and a natural approach to nourish body, mind and spirit. Ayurveda knows that our bodies are the careful balance of three elemental forces or doshas, Vata, Pitta and Kapha (wind, fire and the solidity of earth and water), and understands that disease and discomfort are manifestations of what’s knows as a doshic imbalance. Using personalized treatments, diet changes and herbal remedies, Ayurveda aims to restore balance to the body and mind, and to do so in a way that has profoundly restorative and lasting effects. When the fire of an aggravated Pitta is cooled, or the sluggishness of Kapha is stirred and activated, or the overstimulation of Vata is calmed, discomforting symptoms and associated disease naturally vanish, and, more importantly, so do their underlying causes. The ancient art and science of Ayurveda guides us to heal ourselves, as well, using the simple and beautiful gifts of the natural world and even the quiet intuition of our own beings, as we learn to feel our own imbalances, and easily correct them before problems arise. What are your health and wellness concerns…? Here are my health concerns... I'd like to schedule Panchakarma... I'd like to see Martha for a Consultation... I have questions about products... Just saying Hi! "My soul rejoiced the moment I lay down on the massage table. Panchakarma has been the most sublime treatment I have ever received, gently healing layer after layer, once and for all." Ayurvedic consultations are a great way to begin your journey, in which your Ayurvedic pulse will be taken, as well as an understanding gained from your tongue, which in many ways acts as a mirror for the body. The pulse diagnosis itself is a fascinating process -- each fingertip is divided into five sections, and there are seven levels of pressure, all of which help the Ayurvedic doctor have not only a full and accurate picture of your situation, but understand the best remedies. In a consultation at Surya, Martha, Surya's Ayurvedic doctor, will assess your body's core nature and imbalances, and create a plan for your unique situation, which may simply be some diet changes and herbal recommendations, or recommendations for self-care at home, or restorative and rejuvenating treatments, as well. 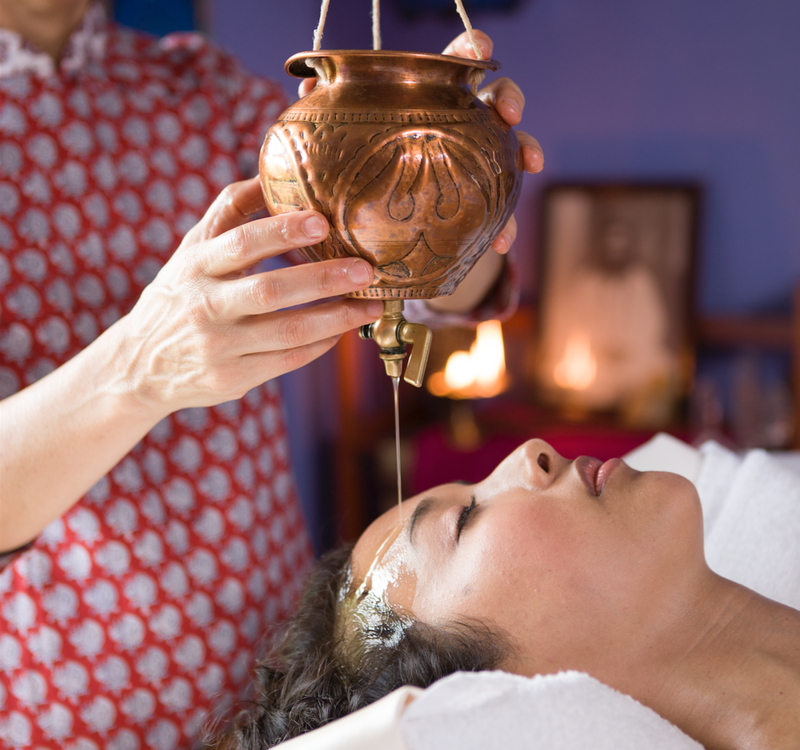 Panchakarma is the ancient Ayurvedic series of nourishing, detoxifying and restorative treatments, which, at Surya, typically occur over the course of 5-7 consecutive days, and often extend to 21 days. These Ayurvedic treatments, or Panchakarma Retreats, dramatically improve health and wellbeing by returning balance to the body. They’re also wonderful to receive, as two therapists work on you simultaneously in a synchronized massage therapy, using warm oil that’s been herbalized and cooked all night, for your specific health concerns. At Surya, one of the most wonderful applications of the restorative and nurturing power of Ayurveda is in the field of fertility, conception, pregnancy, and, the first six weeks of postpartum. The transformation that begins at conception and continues through postpartum is one of the rewarding gifts a woman receives, and during this period of rapid change, Surya’s Mother Baby Program supports new mothers and their partners every step of the way, setting the stage for the growing baby, and for the ongoing health and wellness of the family. Surya’s Mother Baby Program focuses on natural fertility, maximizing conception, traditional and restorative prenatal massages and treatments, as well as a personalized in-home program beginning immediately when upon return from the hospital, or directly after a home birth. "Despite being a dedicated baker myself, I frankly must admit that this bread surpasses any paleo bread I have made or eaten. The care & Ayurvedic knowledge they craft their bread with gives it its cachet. The light sweetness and its pillowy texture reminiscent of bakeshop sweet breads is unsurpassed."